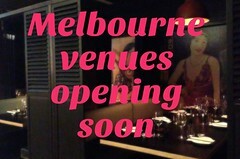 melbourne gastronome: Wot's all this then? 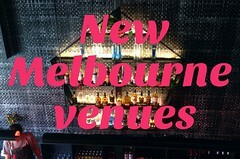 Regular readers may have noticed that the layout of Melbourne Gastronome has been all over the place the last few days. I really wasn't happy with the look of the blog, so have been playing around with it - thank you for your patience. And a big thank you also to Chris Zissiadis, whose Hockneyesque image now adorns the Melbourne Gastronome header. Do yourself a favour and check out the very talented Ziz's photographs here, here and here. If anyone has any difficulties viewing the new-look site, please let me know! You must try (if you haven't already) a new place (open two weeks ago today) in the City Square called La Vita Buona. It's a delicatessen/wine bar/wine shop on the same principle as Wine Shop, but much more reasonably priced on what is an excellent choice of Old and New World wines. There is an enormous selection of wine and you can drink it there at $15 more. A good, small selection of well-priced snaky food - salumi (no bresaola that I could see last night, I'm afraid! ), a few cheese specials, good smoked salmon. And I think there is also a proper main dish every night at around the $18-20 mark. Sorry for the staccato delivery, but I thought you would really enjoy this place. thanks for the plug, image looks nice, all the best with the continued success of your blog, thanks for the tips,.. I'm hungry. Andrew - glad you like the photo and thanks for the recommendation. It sounds like you've already written it up for me! La Vita Buona sounds divine, will arrange to go there with a friend on night next week. And as for bresaola, I bought some in a vacuum sealed pack the other weekend at the Abbottsford Convent market and opened it up last night - had some with parmigiano shavings and a drizzle of EVOO - exquisite! I like the new look! Nice and open, fresh and almost sunny (something we need in the middle of winter). I'll also give a very enjoyable nod to La Vita Buona. Had a lovely nibble of an "open baguette" there the other night for just $8. Your choice of chorizo, salami, jamon or prosciutto with some slices of thick fresh bread drizzled in olive oil and served with rocket salad and aioli. I've also noticed a bottle of Grand Marnier Cuvée du Centenaire open on the counter for $15 a nip. It's on my to-do list now. Hi Johanna - glad you like the avatar photo... but I like yours better! Glad you like the new look, Simon... Okay, you and Andrew have badgered me into (very happily) deciding to go along to check out La Vita Buona midweek. To accompany me I have invited O, who is most appreciative of good wine and food. I'll report back soon!